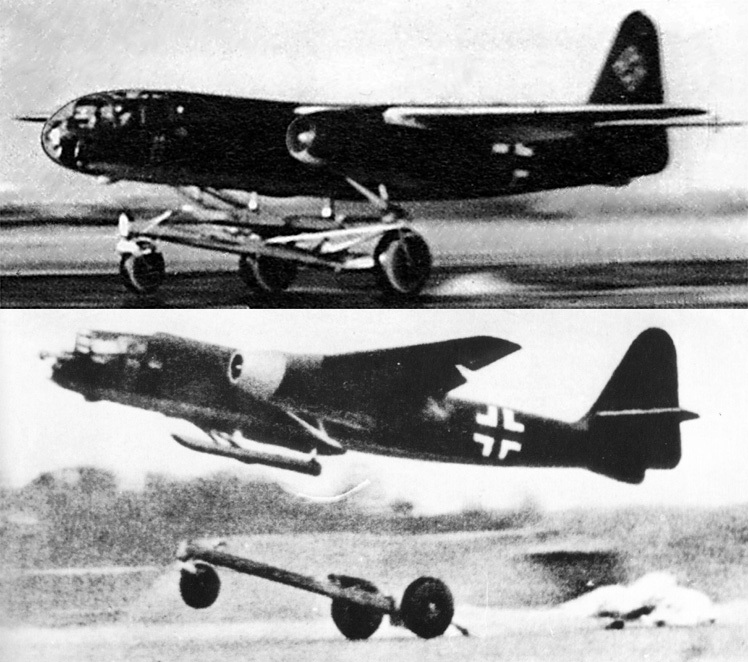 The Arado Ar 234, the first operational jet-bomber was nearly impossible to intercept. 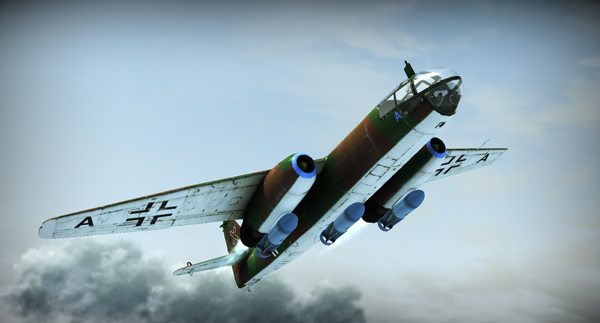 While the Messerschmitt Me 262 was Germany's first operational jet fighter, the Arado 234, commonly known as the Blitz (lightning), was its first operational jet-bomber. However, for the most part, the Ar 234 was used as a reconnaissance aircraft and was nearly impossible to intercept. The RLM commissioned six prototypes in April of 1942 and two airframes were completed during the winter of 1941 and 1942. However, the Junkers Jumo 004B-0 turbojets were not delivered until February 1943. When they finally did arrive, the engines were not cleared for flight testing and were used only for taxi trials—airworthy engines did not arrive until later in May. The maiden flight was on June 15, 1943 at Rheine Airfield, flown by Arado's chief test pilot, Flugakapitän Selle. On December 20, 1942, the order increased to a total of twenty airframes.2 Two prototypes were reserved as static test beds to be configured with four engines. The Ar 234 had an unswept high-mounted wing with a tapered chord, and fitted with Frise-type ailerons. The tail unit consisted of a curved vertical stabilizer with unswept horizontal stabilizers mounted higher than the wing. The fuselage was pencil-like with a rounded nose section and was well-tapered aft. The single-seat cockpit was almost completely glazed which provided excellent forward visibility for the pilot. However, the rear view was blocked by an integrated spine which ran the full length of the fuselage. To provide visibility aft of the fuselage, a periscope was installed in the cockpit. Self-sealing fuel tanks were installed in the fuselage forward and aft of the wing. The Ar 234A prototypes were launched from a jettisonable three-wheeled trolley and landed on skids attached to the belly and engine nacelles. 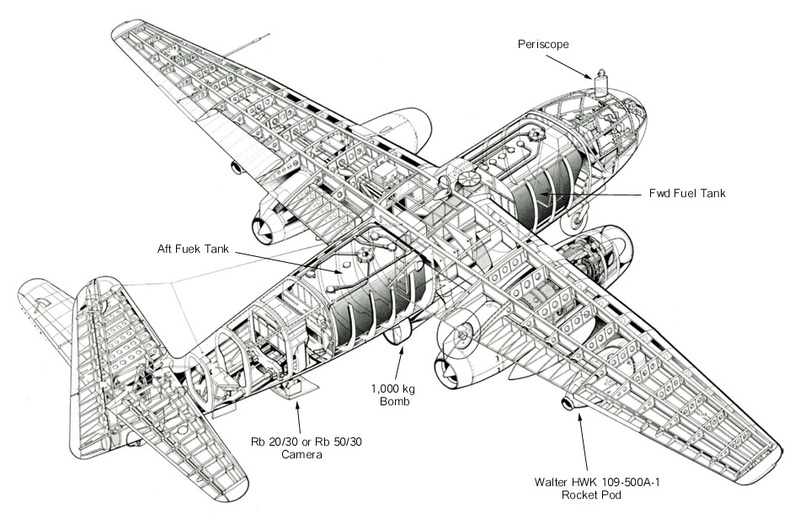 The original Ar 234 prototypes were launched from a jettisonable three-wheeled trolley and landed on skids attached to the belly of the aircraft and engine nacelles. From an operational standpoint, the trolley proved impractical (three jacks were required to reset the aircraft on the trolley) and the B-series was developed with a conventional tricycle-type, retractable landing gear. The fuselage was widened slightly to accommodate three large "donut-style" low pressure tires, used to counter the narrow track landing gear. The V9 was the first Ar 234B and made its maiden flight on March 10, 1944. It was fitted with a pressurized cockpit, ejection seat and two ETC 503 bomb racks beneath the engines and was used to test the BZA bomb aiming computer. The V10 was similar to the V9, but was not pressurized nor fitted with an ejection seat. The V11 was also similar to the V9. The V15 and V17 were both fitted with two BMW 003-1 turbojets, but the BMW 003 was a very troublesome engine when it first appeared. The BMW 003 suffered the same developmental problems as the Jumo 004, but after adopting the more successful Jumo throttle mechanism, the engine was finally ready for production. However, if the 003 experienced a flameout, it was very hard to restart in flight. The V13 was similar to the V8 and fitted with four BMW 003A-1 turbojet engines in paired nacelles. The V13 arrangement was chosen to produce the Ar 234 C-series.5 The V26 and V30 were configured with a laminar flow wing. The Ar 234B-1 was a reconnaissance aircraft that could carry two Rb 20/30, two Rb 50/30 cameras or a combination of one of these and an Rb 20/30. Photographic missions were normally flown at 9,000 m. (29,530 ft.) The aircraft easily evaded interceptors, but Ar 234 pilots were warned not to try and out-turn pursuing aircraft as this would reduce their speed. The Ar 234B-2 was configured as a bomber which could carry a 2,000 kg (4,410 lb) bomb load. The bomber was equipped with Patin PDS three-axis autopilot with a LKS 7D-15 overriding control, and Lotfe 7K tachometric bomb site. A BZA bombing computer in conjunction with the RF2C periscope site was used for shallow-dive bombing maneuvers. Only shallow dives were permitted so as to prevent flameouts. The V19 was the first variant designated as the Ar 234C and was powered by four BMW 003A-1 turbojets in twin engine nacelles. The C-series switched to the BMW engines in order to free up production for the Messerschmitt 262, but the changed improved overall performance with airspeed increasing by 20%. V21 through V30 were also prototypes developed for the C-series. The Ar 234C and was powered by four BMW 003A-1 turbojets in twin engine nacelles. The nose wheel of the C model was larger than the B and it had experimental air-brakes. The V20 was similar, but had a pressurized cabin. The Ar 234C-1 was the reconnaissance version and the C-2 was the bomber version, but the C-1 carried two rearward firing MG 151/20 cannons. These were replaced with the C-3 version V21 to V25. The cockpit was redesigned to improve visibility, it had two rearward-firing MG 151/20 cannons, and two nose MG 151/20 cannons. It could also carry a variety of bombs on ETC 504 bomb racks. The D model was a two-seat version based on the B model fuselage and was to be powered with two Heinkel HeS 011 turbojet engines. Only 19 HeS 011s were built and the Ar 234D was never produced. The prototypes V5 and V7 were pressed into action following the Allied invasion of northern France during D-Day in June of 1944. With a maximum speed of 735 km/hr (459 mph), the Blitz easily eluded Allied piston-engine fighters. The first Ar 234 combat mission, a reconnaissance flight over the Allied beachhead in Normandy, took place August 2, 1944. It was the last Luftwaffe aircraft to fly over England during the war, in April 1945. The combat radius required was 1,240 miles. On February 11th, 1945, the first Ar 234 was shot down by a Hawker Tempest of the Royal Air Force (RAF) while returning home from a reconnaissance mission over England. The only surviving Arado 234 is at the Smithsonian Institute. The only surviving Arado 234 is at the Smithsonian Institute. It is an Ar 234 B-2 and served with bomber unit KG 76 from December 1944 until May 1945. It was captured in Norway by British forces and turned over to US Forces. In 1946, it was brought to Wright Field, Ohio for flight testing. In 1949, it was transferred to the Smithsonian and underwent a five year restoration from 1984 to 1989. 461 mph (742 km/hr) at 6,000 m.
1. Chris Chant. From 1914 to the Present Day, The World’s Greatest Bombers. Edison, New Jersey: Chartwell Books Inc., 2005. p 137. 2. Joachim Dressel and Manfred Greihl. The Luftwaffe Album, Fighters and Bombers of the German Air Force 1933-1945. New York: Sterling Publishers Co. Inc., 1997. 148. 3. J.R. Smith, Antony L. Kay, E.J. Creek. German Aircraft of the Second World War. London: Putnam, 1985. 44. 4. David Mondey. The Concise Guide to Axis Aircraft of World War II. New York: Smithmark Publishers, 1996. 19. 5. Ray Wagner and Heinz Nowarra. German Combat Planes. Garden City, New York: Doubleday & Company, Inc., 1971. 377. 6. Joachim Dressel and Manfred Greihl. 149. 7. Bryan Philpott. The Encyclopedia of German Military Aircraft. London: Bison Books Ltd., 1981. 81. Created June 25, 2013. Updated May 21, 2015.